« Is the government about to take action to save Papua’s forests? Large-scale oil palm plantation expansion in Sumatra and Kalimantan has resulted in environmental degradation, exceeding the state’s ability to control its impact. Currently oil palm plantation expansion is moving towards the east of Indonesia, creating multidimensional consequences for the community of Gane in the South of Halmahera island, North Maluku. The people of South Halmahera, who have managed to survive for hundreds of years in an area with few water resources by cultivating perennial crops in the forest, are currently experiencing drought and the destruction of coastal ecosystems caused by the forest being denuded to make way for oil palm plantations. “PT. Korindo’s plantation is located in three sub-districts, South-west Gane, which is made up of eight villages. South-east Gane, where there are five villages, and the Goronga Archipelago, with seven villages. The company’s plantation area was described in the South Halmahera Bupati’s decree 103/2011, issuing a location permit for plantation development. 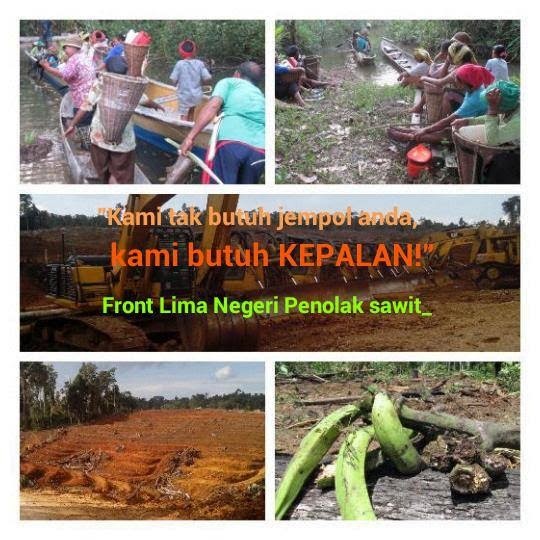 As a response to this situation, the community of Gane has written to the North Maluku office of the National Land Agency to ask it to halt the process of issuing Cultivation Rights Title (HGU) to the Korindo Group, which started on 16th May this year. The area which PT Gelora Membangun Mandiri wishes to develop as an oil palm plantation is 11,003.9 hectares. “The company engages in destructive practices such as clearing people’s land and destroying thousands of seasonal and perennial crops in the process, and has covered over the water source which people in Gane used to consume. What’s more, there are still issues with Korindo’s Environmental Impact Assessment which is the subject of a ongoing legal process in the North Maluku police headquarters. The Gane People’s Resistance Front had previously written to the Jakarta office of the National Land Agency stating their opposition to PT Korindo’s proposal of Cultivation Rights Title because their customary land, including cultivated land, was included in the proposed HGU area. This entry was posted in Around West Papua and tagged Gane, Korindo, PT Gelora Mandiri Membangun. Bookmark the permalink. Comments are closed, but you can leave a trackback: Trackback URL.